Adhesion system technology is always evolving. Learn the basics about today’s adhesion-promoting products to ensure long-lasting enhancements for every client. 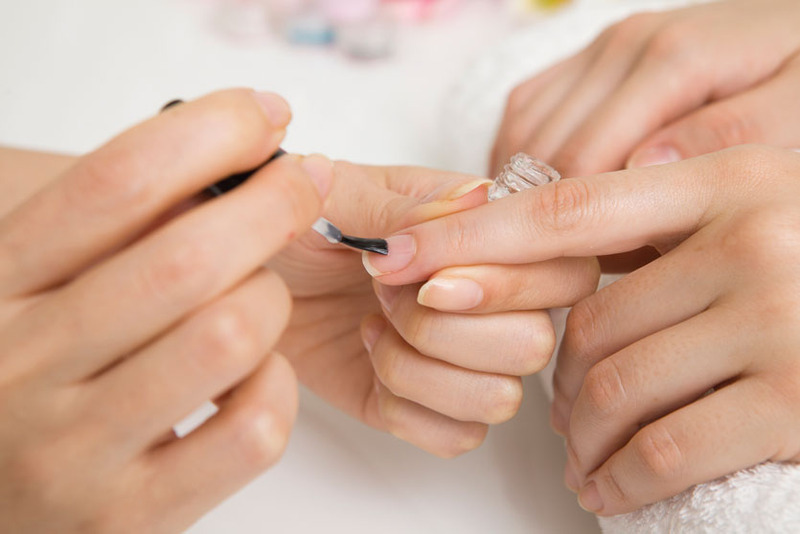 As new products flood the nail market and clients become savvier, there are high expectations for professional results. “Clients must feel the investment they make has value beyond the time spent at the salon,” says Roxanne Valinoti, education manager for CND. That means problem-free nails that don’t chip, peel or lift, she says. Fortunately, nail prep and adhesion products, if used properly, provide techs with an arsenal of secret weapons against the dreaded service breakdown. Thanks to the many technological advances, adhesion systems have never been better. “Long gone are the days where the nail plate needs to be ‘roughed’ or ‘buffed’ to create a compatible surface,” says Valinoti. Today’s adhesion-promoting products, from base coats to acrylic primers, are designed to optimize compatibility and create strong bonds between the natural nail and the nail enhancement—all without the burning, strong odor, yellowing or aggressive filing associated with the service in years past. Understanding the detailed chemical wizardry at work can be daunting though, especially since brands may classify similar-functioning products in different ways. But fear not! This general primer on the basics of modern-day adhesion systems will help you keep lifting at bay. Nail preparation products act as the first line of defense against lifting by altering the nail’s surface to make it more receptive to the compound that follows. “These products remove oils, moisture, water, debris or any other item that could prohibit the primer or bonder from working correctly,” says Jim McConnell, president of McConnell Labs/Light Elegance. In the past, these products were primarily reserved for enhancement services, but now techs are reaching for them regularly for all nail services. “It’s always a good idea to use these products before putting anything on the nail,” recommends Paul Bryson, principal scientist at OPI. While many systems include combination offerings that accomplish more than one task, prep products typically provide three functions: cleanse, dehydrate and balance pH. Dehydrate Moisture also interferes with the formation of good molecular bonds. 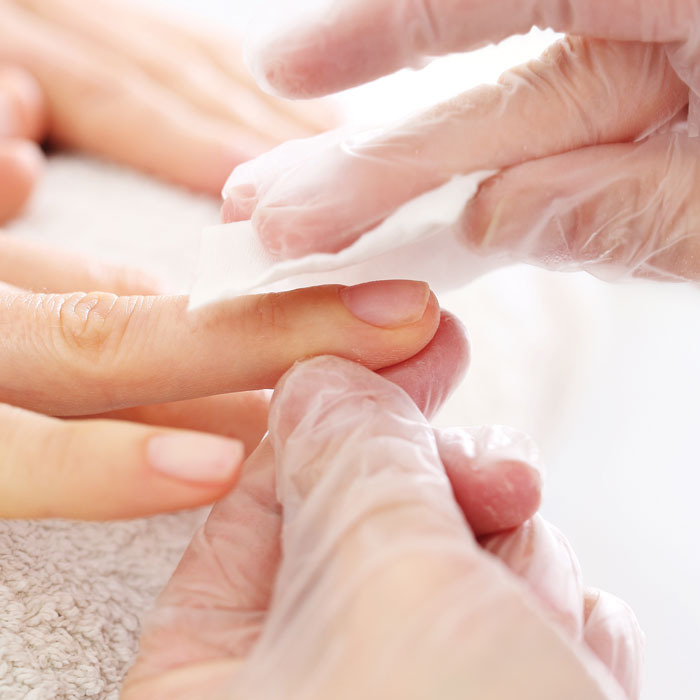 “Even if you’ve thoroughly dried the nails after scrubbing, the surface of the plate will be covered with an invisible, ultrathin layer of moisture,” says Doug Schoon, president of Dana Point, California-based Schoon Scientific. “This moisture layer must be removed to ensure proper adhesion, especially for artificial enhancement products.” Nail dehydrators temporarily evaporate surface moisture for up to 30 minutes—plenty of time for the enhancement to harden before the nail rehydrates. Balance pH The function of pH adjusters is to make the surface of the nail more alkaline (less acidic). This promotes adhesion because an alkaline surface will attract the acid groups in products. If using separate products, always cleanse, dehydrate and then balance pH. Brushing dehydrator or pH adjuster on dirty nails is not only a waste of time, it also contaminates the bottles, leading to adhesion issues for future clients. Also, never blow on the nails to speed up evaporation; this will contaminate the nail and compromise your prep work. Today’s acrylic primers improve adhesion through molecular bonds. Like double-sided tape, a bond is created when a primer molecule links one “arm” with the molecules in the nail and the other arm with the molecules in the product. Hydrogen bonds are temporary bonds formed when neighboring molecules are attracted to each other, but not permanently linked, while covalent bonds go beyond attraction where electrons are actually shared between atoms. “Covalent bonds are the strongest chemical bonds and are longer lasting than hydrogen bonds,” explains Schoon. Original primers, called acid-based primers, contain methacrylic acid (MAA)—not to be confused with methyl methacrylate (MMA), which is now prohibited in many states. MAA-based primers create a hydrogen bond with the nail and a stronger covalent bond with the acrylic on top of it. MAA is highly corrosive to the skin and can cause painful burns and discolor acrylic. However, the product is safe and effective if used and handled properly, and some techs still prefer it over other options. The term “non-acid primer” is a misnomer. While these primers lack MAA, they still contain other milder acids, which produce weaker hydrogen bonds than acid-based primers. “Non-acid primers are less of an issue for skin exposure, but don’t cut through oil and grease as well, so proper prep is even more important,” says Bryson. Acid-free primers, however, don’t contain any acid at all. “Acid-free primers work in a different way,” says Schoon. “Both sides of their molecules create covalent bonds between the nail plate and enhancements.” Odor and yellowing aren’t a problem, and without a corrosive component, there’s no risk of burning the skin. Some primers require removing the shine from (but never aggressively filing!) the nail before application, so read the manufacturer’s instructions carefully. When applying primer, less is more—especially if using acid-based products. Remove excess primer from the brush and lightly dab it onto the center of the nail, allowing it to spread. Do not brush it on like polish. The word bonder can be used generally to describe any product that promotes adhesion between the natural nail and a nail product. Most often, however, the term is associated with the base/bonder gel in gel polish and enhancement systems. Like primers, these products change the surface of the nail to promote chemical bonds between nail keratin and gel enhancements. These products have a thicker viscosity than acrylic primers and use UV light- activated ingredients to promote adhesion. Do acid-based primers thin the nail? Absolutely not, according to Doug Schoon, president of Schoon Scientific. While methacrylic acid (MAA) primers can be corrosive to the skin and cause some product to yellow, they don’t “eat” the nail—a myth often believed (and repeated) by techs. Schoon, esteemed in the nail industry for his scientific expertise, once proposed an experiment to prove it: Put nail clippings in a bottle of primer and let them soak until you retire. In June 2000, Paul Bryson, principal scientist for OPI, took Schoon up on the challenge. He placed his own nail clippings into a bottle of MAA primer and ran the experiment for 15 years! “In June 2015, the nail clippings weren’t dissolved, broken down or otherwise ‘eaten,’” he says. So what causes nail thinning? Aggressive (and unnecessary) over-filing and heavy-handed removal are the most likely culprits, he says. “It’s easy to know when to use a primer or bonder: Read your system’s directions. Both primers and bonders are designed to promote adhesion. The formulas are different, but their function is the same. In the beginning, there were only primers. Primers got a bad name, as their formulas were corrosive to the skin. Now manufacturers are producing non-acid primers. A primer acts as an anchor between the natural nail and nail enhancements; more primer doesn’t lead to more adhesion.” —Doug Schoon, president, Schoon Scientific. “Acid-based primers were used to chemically etch the nail plate for products to adhere to the natural nail. Careless overuse of these expose the hyponychium to acid, causing onycholysis, or separation of the nail plate from the nail bed. To rectify this concern, non-acid primers, like Artistic Nail Design Rock Hard Opening Act, were created. This formula consists of two molecules—keratin that bonds to the natural nail and acrylate, which attracts enhancements—providing superior and safe adhesion.” —Alisha Rimando, creative director, Artistic Nail Design. “I like to explain to clients that a manicure is just like a good skincare routine. If you use quality products as part of your everyday regimen, your skin can be flawless—the same goes for nail care. You must use the right products to protect the nail and give the color application its best chance for long wear. Cuccio Veneer #1 Prime works like a toner; it removes excess oil or water left on the nail prior to color application, creating a clean, prepped surface. Cuccio Veneer #2 Fuse works like a serum; it gives Base Coat something to adhere to and will be your best ally in prolonging your gel manicure.” —Rachel Schafer, managing director, Cuccio Colour. “Dazzle Dry Nail Prep is our primer. It removes oil and other residues from the nail plate. A properly prepped nail surface gives maximum adhesion of the bonder. A bonder ties the principal coating to the nail. Dazzle Dry’s bonder is called Base Coat—an elastic layer that sticks to both the nail and lacquer. Because of its elasticity, the rigid lacquer remains attached to the nail even though the nail changes in dimension (swells when wet and shrinks upon drying) during our daily activities.” —Vivian Valenty, president, VB Cosmetics. “We like to think of primers and bonders as double- sided sticky tape. Our non-acid primer—or bonder— Divinity Love is a product that chemically adheres the artificial enhancement to the nail plate. Years ago, primers were primarily made of methacrylic acid, which was easily identified by a pungent “stinky feet” smell. As our artificial enhancements have chemically evolved, so have our primers into less invasive chemicals.” —Elaine Watson, vice president, Kupa. “The differences between dehydrators, primers and bonders are based on the system. Dehydrators are meant to remove excess oil using ingredients like ammonium hydroxide and ethyl acetate. Primers are used to chemically buff the nail and usually contain ingredients similar to monomer liquids. For acrylic systems, such as OPI Absolute, we recommend BondAid then BondEx as the last step of prep. For soft and hard gel systems, we recommend only BondAid as the last step of prep before applying base gel. Per OPI education protocol, base coats and gels are our bonders.” — Darlene Sritapan, educator, OPI. “For a long time, nail professionals didn’t understand the importance of proper nail preparation and relied almost exclusively on harsh acid-based primers to maximize enhancement adhesion. With the industry’s evolution, we’ve learned that if the nail is properly prepped with quality products, there’s no need for harsh chemicals. Ugly Duckling Prep and Primer are gentle on the nail while still providing maximum adhesion. Nail Prep is a pH-balancing cleanser and dehydrator that is dye- and fragrance-free. Use acid-free Primer after Prep to create the ultimate bond to your acrylic or gel.” —Yvonne Duclos, president, Ugly Duckling.